Google made some interesting announcements yesterday that could have a profound impact on the existing app interaction model and even how we think of apps. 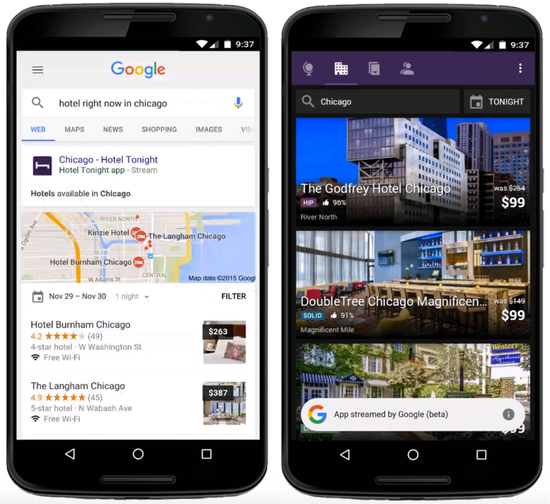 Google search now has the ability to search for app-only content, an outcome of Google's app indexing efforts over the past two years. More importantly, Google announced an experimental program to "stream" a limited set of apps directly from the Google app. This appears to be an attempt to make apps behave more like the web, in effect removing friction from the existing app paradigm. This experimental program is the result of Google's recent acquisition of Agawi, an app streaming startup. In simple terms, the app runs on a virtual machine in Google's cloud, while the Google app transfers device level input (touches, taps, maybe even sensor input) to the cloud and streams the current app interface. The implications of this are very interesting when combined with Google's other mobile initiatives. Today's app interaction model has two primary bottlenecks -- discovery and access. With the number of apps available on leading platforms, finding one relevant to your current need can be a pain. Google already has a solution targeted at this problem -- Google Now on Tap. Based on your current app screen and other relevant data (which Google has a lot of), Now on Tap suggests specific actions that can be taken within a small set of apps (via deep linking). At this point, this is limited to a small set of apps installed on the user's device. But in a year or two, this should be extended to a much larger set of apps. However, this introduces another layer of friction -- an app store detour is required if an app is not installed on the device. Instead, Google's goal is to "stream" the app directly through the Google app. Also, "app-access ads" may be much more valuable than "app-install ads" which explains Google's motivation. Early on, the performance of "app streaming" is likely to be sub par, but I have no doubt that this will become "good enough" in no time. Would users prefer to stream apps rather than install them one at a time? The answer seems rather obvious to me. Also, Android users could use "homescreen shortcuts" to frequently used "streamed apps" as a substitute for native apps. This should be very popular in emerging markets with memory-constrained devices. The emergence of "good enough" app streaming also brings up some interesting questions. If Google is already indexing both iOS and Android apps, and can stream apps (at scale) from virtual machines running in their cloud, what stops them from streaming iOS apps to Android users (or vice versa)? Does this have the potential to break down the boundaries between mobile platforms, much like the web did so many years ago? Can this usher in a "post-Pagerank" era for mobile? How would this affect competitive dynamics for platforms and OEMs? I don't know the answers to any of these questions yet, but I do know that the "Peak Google" narrative sounds more and more far fetched every day.